The 10 Best Steakhouse in Michigan! Steak is an American classic, so it’s important to find your favorite spot to dine on a fresh cut of meat. Michigan is home to more than a few places to land a top-notch piece of juicy, meat, cooked to your preference. So where do you go to get your steak craving satisfied? Stick around for the sizzling, savory details as we check out 10 great Michigan steakhouses! Though Bill's Steakhouse in Bronson may not look like much from the outside, it is an unqualified winner as far as the steak goes. Home to some absolutely heart-stopping meals, the XXL Porterhouse at an impressive 32 ounces is one of the all-time greats, available only “while they last” each day. Smaller steaks and prime rib are also on hand, and the servings are often so large that some wonder how anyone could ever order dessert there. The wait staff, however, assures that some indeed do. Harbor Springs plays host to this unlikely hit, ranked number one on MLive's 2015 list of the best steakhouses in Michigan. Vernales bills itself as a chop house, wine cellar and sports bar, which is kind of a shocking combination, but one that really works when you look at it closely. Featuring three separate menus—one for each of the three sub-locations—it's about the only place you can get a burger in the same place as a 33-day dry aged bone-in strip steak coated in Himalayan salt. When it comes to the best steak in Detroit, the clear winner is Iridescence in the Motor City Casino. That's only kind of a surprise, given that casinos typically have impressive steakhouses to their credit. Iridescence, however, offered up not only a 12-ounce New York strip steak, dry aged for 28 days, but also a wine list that's won the Wine Spectator Award five times. Throw in an amazing view of Detroit itself, and it's easy to see why this place receives so many accolades. It's a simple name that the Chop House in Ann Arbor goes under, but sometimes the simplest packages contain the most magnificent prizes. That's what's going on at the Chop House, home to a meal that starts with opulence—like crispy fried Maine lobster bites—carries on into excess with a 24-ounce dry-aged porterhouse and finishes with dessert so amazing it has its own separate pastry shop. It's called La Dolce Vita, and it even throws in port and dessert wines, cognac, bourbon and single-malt scotch along with cigars for after dinner. Traverse City has done it again with the Copper Falls Rok and Grille steakhouse, a magnificently opulent display of dinner fare. Sure, the steaks won't be huge—the biggest cut on the menus is a 16-ounce ribeye—but it's what it will come with that's impressive. The 12-ounce New York strip, for example, is served with bone marrow butter and a truffle demi-glace. From there, you can be astonished by the seafood options, the pasta choices, your choice of six different salads, and more. While repurposed depots aren't exactly new anywhere, Mountain Town Station Brewing in Mt. Pleasant will be a whole different matter. It's not only a former depot, but it's also a steakhouse and brewery, which is an unexpected combination. The menu features plenty of prime steak fare, but also goes on to things like Sushi Wednesday and an old-fashioned pot roast dinner on Sunday nights. Throw in eight different kinds of beer—some of which make it into the recipes—and the result is an exciting steakhouse option. You're going to Marquette for Elizabeth's Chophouse, and yes, you too can be shocked that an upscale steakhouse dining experience is found in the Upper Peninsula. How does a 40-ounce prime rib sound for a start? How does it sound when they tell you they'll not only cook it well done, but they'll take responsibility for that well-done steak because “they're that good”? That's a shocker in its own right, and the menu carries on with a litany of some of the best steakhouse fare from king crab legs to half-pound lobster tails. Allegan is home to a steakhouse experience—the Grill House—that may actually be too impressive for one place. Not only does it feature your normal array of steakhouse fare, but it also boasts two key features not to be missed. One, the place is said to be haunted by a ghost of a lumberjack the locals call “Jack.” Two, the restaurant will actually let you cook your own steak. 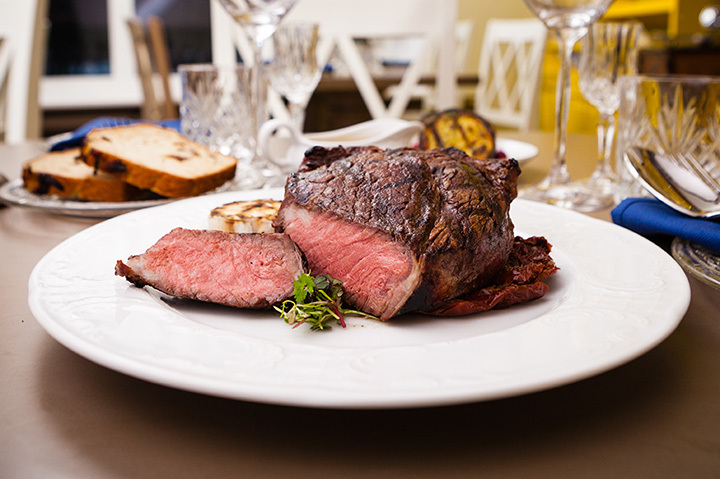 Home to the Grill Room, a 30-person grill allows budding chefs to cook a steak to precision doneness, and then offers unlimited potato, baked beans, Texas toast, sautéed onions and salad. The Maple Grille in Hemlock, between Alma and Saginaw the long side around, offers chicken eggs for sale. Yes, we know we're talking about a steakhouse. But we had to kick it off with a plug for the chicken eggs because it proves the sheer diversity of this operation. The Maple Grille, you see, is a farm-to-table operation, which will allow you to literally drive through the area and see the beef you may well be eating in a matter of days. The restaurant is heated by local maple, the beer on tap is home-brewed by the owner's father, and the menu changes on a weekly basis. Up for a trip to Clawson? Wondering where Clawson is? Well, you have more reason to find out than ever thanks to the eponymous Clawson Steak House. Home to Delmonico steaks, an array of chops, wonderfully fresh Michigan perch and bone-in Wagyu beef, the array of options at Clawson Steak House is easily a match for many big-city operations. Throw in the live musical stylings of the Mark James Band Wednesdays through Saturdays and that's all the reason you'll need.